By tour0655 on 13 June 2012 . 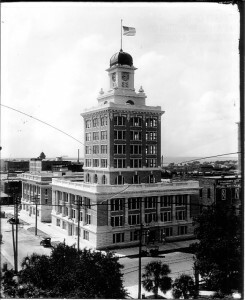 Tampa’s Historic City Hall was one of many notable buildings design by architect M. Leo Elliott. At the time he was partners with architect B.C. Bonfoey. It was constructed by McGucken and Hyer Contractors for a mere $235,000. The cornerstone was laid in January 1915 with Masonic ceremonies featuring Mrs. Maria Moore Post, widow of Madison Post, Tampa’s Third Mayor. Dubbed by The Tribune as ‘Tampa’s City Hall Layer Cake’, The architectural style of the building has been described as Eclectic – with Doric columns, terra cotta details and a balustrade around the main block. It is 10 total stories, including seven stories in the tower and three main stories. The structural system of the building is poured in place concrete post and beam on concrete bell footings. Floor slabs are hollow structural clay tiles with concrete infill. Masonry and stone are used as facing materials. Tampa’s City Hall was built on land that had been occupied by an 1842 frame home, which Imboden Stalnaker, a pioneer East Tampa merchant purchased in 1914. He moved it to 3210 8th Ave. to save it from destruction and it stands to this day as Tampa’s oldest house. At one time, the first three floors of the building had a twin building immediately to the south. This annex completed in 1916 served as the new Police Station and Jailhouse and replaced the original old two-story red brick building which served as Police, Fire and City Office Headquarters. In 1914, the socialite daughter of prominent Tampa physician Louis Sims Oppenheimer, was dismayed that Tampa had no municipal clock to give the proper time, and none was planned for the new city hall. Miss Oppenheimer was incensed at the city fathers. The City determined that they were too poor to afford clockworks for the clock tower, so Miss Oppenheimer launched a campaign to fund one. Her organization, “Ye Town Criers”, raised $1,200 by sponsoring various entertainments. Their efforts fell somewhat short, but they were successful in raising enough money to have the W.H. Beckwith Jewelry Company donate the balance and provide a 2,840 pound, four-faced clock for city hall. M. Leo Elliott was born in 1886 in Woodstock, New York. He attended Cooper’s Institute in New York City and received training at the New York City firm of Welch, Smith & Provost. Early in his career he helped design buildings for the Jamestown Exposition of 1907 in Norfolk, Virginia. At the age of 21, he moved to Tampa and formed a partnership with Bayard C. Bonfoey. They designed the Tampa YMCA (1909), Centro Asturiano (1914) and Tampa City Hall (1915). The partnership was dissolved in 1917 and he then created the firm of M. Leo Elliott, Inc., Architects and Engineers. Elliott then designed the Italian Club (1917) and Cuban Club (1918) in Ybor City. In 1925, the firm was doing projects all over Florida, maintaining a St. Petersburg office. Carl Atkinson Sr. was manager of St. Petersburg office during the 1920s. During the peak of the land boom, the firm employed six structural engineers, forty-six draftsmen, and seventeen site inspectors. One of the firm’s major projects in St. Petersburg includes the 1926 Ninth Street Bank and Trust designed in the Neoclassical Revival style. Many of Elliott’s notable projects in Tampa designed during this era remain on Davis Island, in downtown Tampa and Temple Terrace. Other important buildings in Tampa designed by Elliott include the Masonic Temple, the Scottish Rite Temple and the First National Bank. He also designed Sarasota High School. In 1946 the firm became Elliott & Fletcher. Elliott retired from practice in 1954 and died on August 18, 1967.